One of the most common questions we get is "How do I know when to change the filters on my WaterFed® cart?" 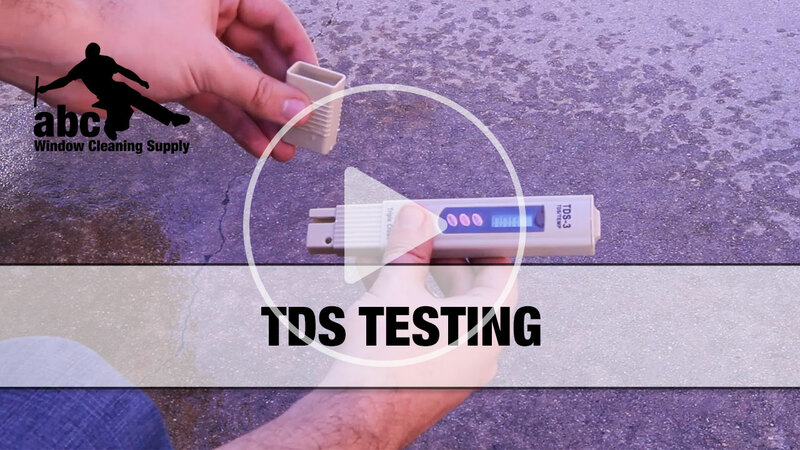 Know when to change each of the filters on your pure water system is actually quite easy using a TDS meter (included with Triple Crown systems and available here). Watch the video or read below to learn how. Knowing when to change the filters on a DI Only system like the Unger HydroPower or Triple Crown Photon is simple. To get spot free results on glass, your TDS (Total Dissolved Solids) should be 10 or less. For opaque surfaces like Solar Panels, it should be below 40. If you are getting a reading higher than that, it's time to change your filter. If you see the number getting close to 10, it's a good idea to have a replacement ready to go. Multi-Filter Systems, sometimes called Multi-Stage or RO/DI, use several different types of filters to purify water more efficiently (i.e. lower cost to operate). Examples of these would be the IPC Hydro Tube, Triple Crown Phaser, or the SG1. Regardless of which system you have, the basic steps for testing each filter is the same. The video above uses the Triple Crown SG1 as an example, but the results work for any WaterFed® cart! First, measure the TDS (Total Dissolved Solids) of your tap water. Make sure to rinse out your cap from the TDS Meter a few times so that there isn't any left over residue. Next, measure the TDS of the water coming out of your RO membrane. You'll likely need to disconnect your DI filter (the last one water goes through in your system). Make sure to run water through the RO for at least 90 seconds before taking this reading. Your RO should be removing 85% or more of the TDS from the tap water. So, if tap TDS was 100, RO TDS should be 15 or lower. When an RO is removing only 90% of the TDS, it's nearing end of life, and when it's removing less than 85%, it's time to replace it. Lastly, measure the TDS coming out of your DI filter. If you disconnected it before for the RO test, re-attach it to your cart. The DI filter should be lowering the reading from your RO membrane AND get the final reading below 10. If it's not lowering the reading from the RO at all then it isn't doing anything and is used up. If it's lowering it a little, but not getting you below 10, it's nearly used up. Either way, it's time to replace it. The Carbon/Sediment filter, which is the first filter in your system, doesn't have a reliable way to test its remaining life in the field. However, it has a similar life expectancy to the DI filter, so we recommend changing it at the same time as your DI filter. It's important to have a functioning Carbon/Sediment filter because it protects your more expensive RO membrane from Chlorine damage. Here are a few examples to help illustrate when each filter in a Multi-Filter Pure Water System should be change. RO filter is removing less than 85% of TDS and should be replaced. DI filter is working well, though it will be used up more quickly than normal since it has to clean up more due to the poorly functioning RO. The RO is working great, but your DI is barely doing anything. Worse, your final result is above 10, so you'll likely see spots. The DI and Carbon/Sediment should be replaced. The RO filter is removing less than 85% and should be replaced. The DI filter is also failing to get you below 10 and should be replaced along with the Carbon/Sediment filter. If you replace only the RO filter, you will temporarily get your reading back under 10, but the DI is nearing end of life and will soon need to be replaced.